This stew is brilliant. My cousin, Betsy, always shares healthy and hearty recipes with my mom. We made this stew last winter after Betsy’s suggestions. After all the holiday indulgences (and over-eating), we decided to resurrect this veggie, vegan, gluten-free stew. Although technically a soup, it’s loaded with beans, carrots, celery, tomatoes, peppers, zucchini, kale . . . the list goes on and is so hearty I’d like to swap the name from soup to stew. While my mom did all the cooking, it’s delicious to share, especially right before the New Year. 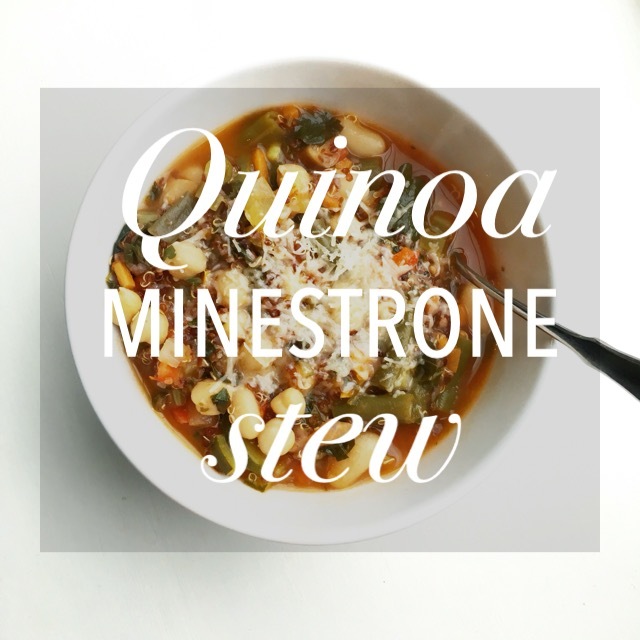 Hope you enjoy this fresh, packed fully of veggies, you-won’t-go-hungry Quinoa Minestrone Stew.